Studio Athletica | Downtown Toronto Wrist Physiotherapy - Call Now. Below you will find a list of symptoms and conditions that we see at Studio Athletica with our Downtown Toronto wrist physiotherapy clientele. At Studio Athletica, we specialize in several different services that can help treat your health problems. Please feel free to read more about your symptoms, conditions and our suggested treatments, or contact us to pinpoint the best treatment to heal your body. The downtown Toronto wrist physiotherapy program is the gold standard. Our Downtown Toronto wrist physiotherapy program sees a lot of wrist sprains. A wrist sprain is a very common injury, which is essentially an injury to a ligament. Ligaments are strong bands of tissue used to connect one bone to another. A sprain can occur if the wrist is bent forcefully, such as in a fall onto an outstretched hand. Wrist sprains can be graded based on the severity of the injury to the ligament itself. Grade 1: When a ligament is stretched and not torn, the sprain is considered mild. Grade 2: When the ligaments are partially torn, the sprain is considered moderate. This type of sprain may involve some loss of function. Grade 3: When the ligament is completely torn, the sprain is the most severe and will require medical or sometimes even surgical care. A Grade 3 sprain is a significant injury and may also take a small chip of bone with it which is called an avulsion fracture. 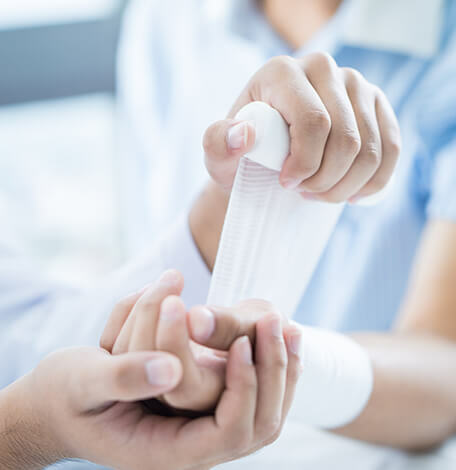 Symptoms of a wrist sprain may include: swelling in the wrist, pain when moving the wrist, bruising, tenderness, the warm feverish skin around the wrist, and pain at the time of injury. Our Downtown Toronto wrist physiotherapy program sees a lot of De Quervain’s Tenosynovitis. De Quervain’s Tenosynovitis is a condition that causes a painful inflammation of tendons in the thumb that extends to the wrist. The swollen tendon rub against the narrow tunnel that they pass through. The condition can happen gradually or start suddenly however, in either case, the pain will feel as if it’s travelling into the thumb up from the forearm making it painful to move the thumb. Most people with the condition will have difficulties pinching or grasping objects while the pain gets more severe when you attempt to move the thumb and wrist. Swelling around the thumb may also become apparent. Although the exact cause of de Quervain’s tenosynovitis isn’t known, any activity that relies on repetitive hand or wrist movements – such as working in the garden, playing golf or racket sports – can make it worse. Our Downtown Toronto wrist physiotherapy program sees a lot of carpal tunnel syndrome. Carpal tunnel syndrome is a condition that causes numbness, tingling and other symptoms in the hand and arm. 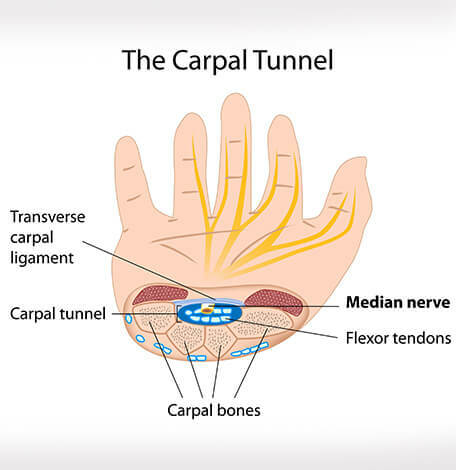 Carpal tunnel syndrome is caused by a compressed nerve in the carpal tunnel, a narrow passageway on the palm side of your wrist. The causes of this condition can vary from pre-existing health issues to possibly repetitive hand motions. Carpal tunnel syndrome symptoms usually start gradually. The earlier symptoms often feel like numbness or tingling in your thumb, index and middle fingers that comes and goes. I may also cause discomfort in your wrist or palm of your hand that feels like a light tingling sensation like an electric shock in the middle and ring fingers. The tingling sensation may also travel to your wrist and up your forearm. These symptoms are most felt when holding your arms out such as, holding a steering wheel, reading a newspaper, or typing at a computer for longer periods of time. Our Downtown Toronto wrist physiotherapy program sees a lot of fractures. A wrist fracture is merely a medical term for a broken wrist. 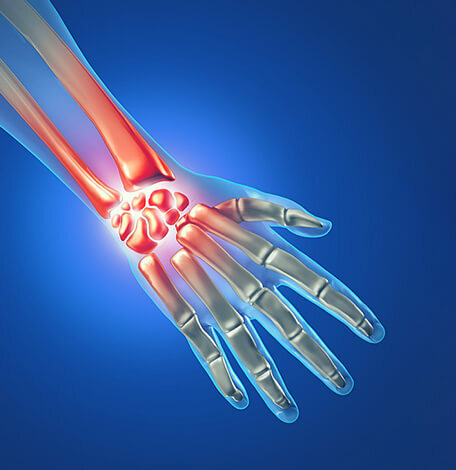 The wrist consists of eight small bones which connect with the two long forearm bones called the radius and ulna. Although a broken wrist can happen in any of these 10 bones, by far the most common bone to break is the radius. It can be caused by a direct injury to the area from a fall onto an outstretched arm or the wrist was forced into an unnatural position. When the wrist is broken, there is pain and swelling. It can be hard to move or use the hand and wrist. Some people can still move or use the hand or wrist even if there is a broken bone. There is often pain right around the break and with finger movement. Sometimes the fingers tingle or feel numb at the tips.